SIX foreigners arrested by the Immigration Department on allegations of staying in the country illegally have gone on a “hunger strike” at the Harare Central Remand Prison demanding their release or to be deported to their respective countries. Some of them accused immigration officials of demanding bribes to facilitate their release although their cases have not been heard in the courts. The detainees narrated their ordeal to the Zimbabwe Prisons and Correctional Services Deputy Commissioner-General Dr Alford Mashange Dube who yesterday visited them after they were admitted to the prison hospital. He reportedly promised to address their grievances. “When they (immigration officials) first arrested me, they demanded $5 000 cash so that they would release me. I did not have enough cash since my wife had just passed on. I only had about $1 650 which I offered them and they took it, insisting they would come back for the balance,” said Charles Oforma (47) from Nigeria who used to run a motor spares shop in Harare and has been in remand since 2015. Ayele Derilo from Ethiopia, who has been in custody for five years, alleged that when he was arrested in Mutare, the officials asked him if he had any cash. Because he did not have any cash, they arrested him, he alleged. The foreigners allege that they have stayed for too long in prison without their cases being heard. There are 109 foreigners currently detained after they were arrested without proper documentation by Immigration officials. In an interview, Deputy Comm-Gen Dube said the six went on hunger strike on December 20. 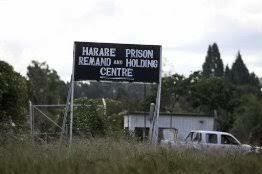 “This hunger strike started particularly with the prohibited immigrants who are housed at Harare Remand Prison. They are six — one from Nigeria, one from Ethiopia, two from Kenya, one from South Sudan and another one from South Africa. What I found out from them is that they had overstayed in remand prison as prohibited immigrants. The longest one has stayed for five years and that is the one from Ethiopia,” he said. “As ZPCS, we do not take them as prisoners or inmates because we have two types of inmates — that is the convicted and the non-convicted. As these prohibited immigrants come in here, we think they are being lodged for the purposes of their deportation,” said Deputy Comm-Gen Dube. He said there was a limit on the number of days according to the Immigration Act and that the immigrants had overstayed. He said ZPCS was worried since some of them had been in prison for more than five years and did not have criminal records in the courts. Deputy Comm-Gen Dube said they were facing challenges given the number of prohibited immigrants in the prisoners. “This is costly to the organisation in the sense that we must feed them on a daily basis, we need to cloth them on a daily basis, we need to look at their health aspect on a daily basis,” he said.